Travelling to Lonavala with your gang and unable to decide where to stay? We found this beautiful boutique villa in Lonavala, which is 5 km away from Bushi Dam and 8 km from Lion's Point. Bella Vista, a boutique 3-BHK Villa is a go-to place for anyone who loves greenery and calm surroundings. Located in the heart of Lonavala, this 3BHK villa offers full-privacy to people who want to have a private time with their loved ones. You can make a splash at the pool, relax in the gardens, binge watch movies on the television or simply unwind by doing nothing. We love that there is a lush private Zen garden as well as a fully-functional kitchen so you can be comfy just staying in. You can always visit different eateries and dhabas present in the vicinity or go hiking and sightseeing as there are many attractions in a radius of 10km. 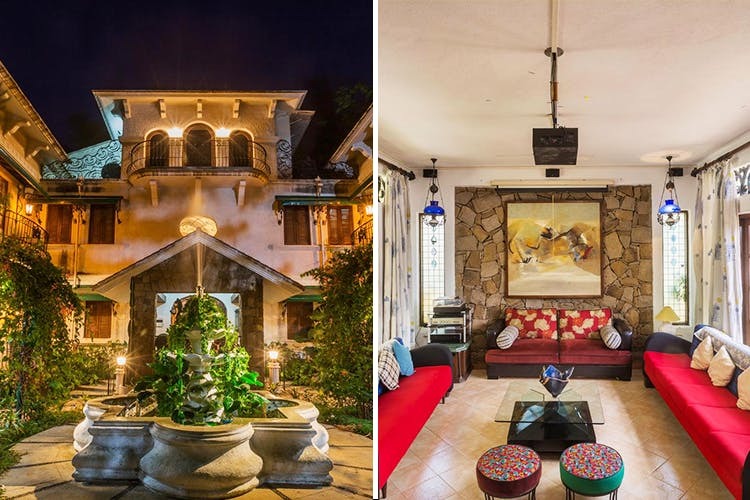 We went gaga over the Victorian-Manor decor of the villa as well as the fountain in the centre. The villa has a private pool and provides barbecue services at an additional cost. We suggest you hold BBQ parties by the pool to make your vacation a memorable one. We feel that the charges for per room are on a bit exorbitant side. No entry is allowed post 10 pm in the villa. If you are going to be late, you need to seek prior permission from the host who is just a call or message away.